Thalia was diagnosed with acute lymphoblastic leukemia on March 30th, 2018, a month after her 5th birthday. Her fight started February 2018 with what we thought was the flu. She ended up being rushed to the hospital and admitted into the PICU the day before her 5th birthday for an extremely low hemoglobin level. After 3 blood transfusions and plenty of tests later, why her levels dropped were unknown. Cancer was brought up to us but her labs kept coming back normal. After being discharged and having weekly lab tests, her hemoglobin levels kept dropping. The doctors finally decided it was time to do a bone marrow biopsy to fully rule out cancer. Her biopsy was done March 29th and we got the call on March 30th that her results came back positive for pre B cell ALL. She got admitted to the hospital the same day and started treatment the very next morning. There have been many ups and downs through her first few months of treatment. No matter what she has always seemed to still stay positive throughout it all. Putting that big bright beautiful smile on her face reassuring us everything is going to be okay. Thalia is now in the maintenance phase of her treatment and was able to start kindergarten. She loves educating her friends and even adults about her cancer and treatment. 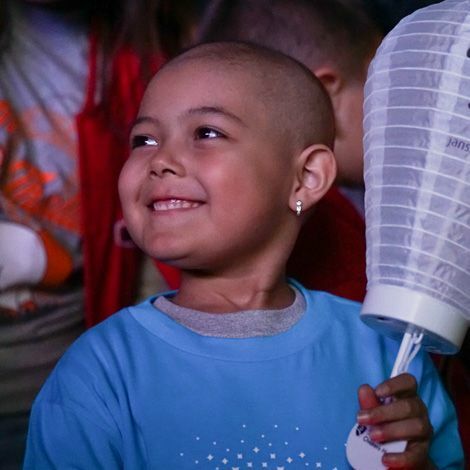 Her dream, when she grows up, is to become an oncologist to help other kids with cancer. She will officially be done with treatment June 2020. She participated in her first Light The Night walk this past October and was absolutely amazed by the experience and wants to participate every year.